In the mid seventies Ballantine Books, just before it renamed itself into Del Rey, launched a “Best of” series of short story collections by classic science fiction and fantasy authors which I personally think is perhaps the best such series ever produced. Just at a time when science fiction was switching from being a short story, magazine orientated genre to one in which the novel is supreme, here were collections by all the old masters who had made their name in the pulp magazines of the thirties, forties and fifties. The series offered a sense of history to the genre just when science fiction was in danger of losing touch with its roots. It offered both a reminder to old fans of what had attracted them to the genre in the first place and to new fans a sampling of authors they may have thought old-fashioned or perhaps never had the chance to read in the first place. One of such authors must have been CL Moore, who had made her reputation writing science fantasy stories for Weird Tales in the 1930s. In the 1940s, after she met and married Henry Kuttner she almost completely stopped writing on her own, instead collaborating with him (often under the Lewis Padgett pseudonym) on a series of classic sf stories, then moving on to writing crime stories and for television, both of which unfortunately paid better, in the late 1950s. By the time The Best of CL Moore was published it had been the better part of two decades that she had written much new science fiction. Now that more than twice as much time has passed, this collection is still a great introduction to what CL Moore had to offer when not collaborating with her husband. The story that first introduced me to CL Moore, ‘Vintage Season’, was however originally published under both her and Kuttner’s names. I first read it in a Dutch anthology of crime and detective stories written by women, which sort of made sense as it can be read as a detective puzzle story. For years that was the extent of my CL Moore reading, until I read this collection. It was enough to realise how great a writer she was. The Best of CL Moore is a well balanced collection, with most of the stories from before she met and married Henry Kuttner. Both of her best known heroes, Northwest Smith and Jirel of Joiry are represented but do not dominate. In general the stories here vary from outright fantasy to pure science fiction, but what they have all in common is the human touch. Her characters are fully human, three dimensional in a way that was rare for pulp science fiction. She builds her stories around the characters of her protagonists, even in the science fantasy of her Northwest Smith and Jirel stories. There are no clunkers whatsoever in here, as we’ll see. ‘Shambleau’ (1933). This is the story that introduced both Northwest Smith and Moore herself to Weird Tales, her first published story. It’s space fantasy of the kind Leigh Brackett also wrote, with some of the clichés of that genre, but already with the same craft and power brought to all the stories here. It starts with a mixed race mob – Martians, Venusians, Earthmen – chasing a slim nutberry brown beauty in a radiant scarlet cloak down the streets of a Martian town and Northwest Smith rescuing her. But she’s shambleau and Smith does not know what this is and only finds out — almost too late. ‘Black Thirst’ (1934). Another Northwest Smith story, about a Venusian castle where they breed beauty and its master who feast on it. Almost as good as the first story. ‘The Bright Illusion’ (1934). A man dying of thirst in the great Saharan desert is set on a quest on a strange world by an intelligence so powerful it can only be described as a god, to meet this god’s priestess and fall in love with her, no matter her innate alienness. This should be schmaltzy as hell, but Moore’s skill as a writer makes this work. ‘Black God’s Kiss’ (1934). The first Jirel of Joiry story, a Medieval French swordswoman whose kingdom is taken over through sorcery, who manages to escape her captor, then has to travel much farther than she could’ve ever imagined for her vengeance. As with the first Northwest Smith story this has an immediate impact: everything Jirel is, is here fully formed. ‘Tryst in Time’ (1936). Another love story, where a man who has grown bored with everything the modern world has to offer, who has tasted all adventure and sensation that’s in it, volunteers to be the guinea pig for his genius friend’s time machine. He gradually realises that in all the historic scenes he witnesses one girl remains constant and falls in love with her – but does she know him and could they ever be together? ‘Greater Than Gods’ (1939). On one man’s decision which of the two women he loved he wanted to marry rested the faith of the future. Hinging on this decision, Earth would become either a slowly dying, rural idyllic paradise, or it would rule the universe but at the cost of human happiness. Which alternative is better and is there truly no other option? As a story it does depend on a certain gender essentialism we’ve largely grown out of, but if you can swallow this, this is a clever, sentimental story. ‘Fruit of Knowledge’ (1940). According to Jewish legend, before Eve Adam had another wife, Lilith, who refused to be dominated by him and therefore was cast aside. Normally I don’t like this kind of Biblical fantasy, but Moore manages to make this story interesting by making Lilith a sympathetic character without quite making either Adam or Eve into the villains of the piece. ‘No Woman Born’ (1944). A woman, the greatest dancer of her generation, is caught in a horrible accident and given an experimental cyborg body, her brain in a metal shell. The male scientists and psychologists responsible for her transformation worry about her and whether or not she can remain human living like this. An interesting psychological story. Moore creates a finely wrought dystopic vision where an oppressive future government utilizes communication networks to spread its tentacles across the United States. Against this backdrop intriguing characters come to life. Her descriptions of the political backdrop remain minimalistic which is surprising for SF of the 1950s which often resorts to lengthy descriptive lectures. Instead, the true extent of the government’s influence on everyone’s lives is only slowly uncovered via our main character’s experiences. The first person narrative is perfectly deployed to slowly immerse us in the world. Doomsday Morning is not populated by your normal heroes, and Moore is careful to point out that not all rebels are heroic. Comus (derived from COMmunications US) rules America but details about how exactly it functions and how it was created are kept at a minimum. Clearly a reference to Communism (Moore is writing in the post-Mccarthyism era), Comus is controlled by the dictator Raleigh who is slowly dying. Vague references are interspersed throughout that allude to a devastating Five Days’ War that resulted in Raleigh creating Comus. Comus maintains power by an adept use of the media – propagandistic plays, movies transformed into plays, control of the actual communication networks. Also, the use of “pyscho-polling” and automated police Prowlers keep the state aware of the moods and seditious inclinations of their populace. A large percentage of the workforce that keeps everyone fed and happy are indentured Croppers. They sign lengthy contracts and receive food, alcohol, housing, and transportation between worksites all of which is deducted from their pay. However, by the time their contracts are up they are deeply in debt and have to sign new contracts. Soon Rohan is summoned by Ted Nye, who rules Comus from behind the scenes, with a proposition. Rohan is to restart his career and head to California which has separated from Comus and perform a play. The play itself seems innocent and even non-propagandistic. The troop he selects, The Swann Players are second rate and there’s a Comus spy in in the mix. As Rohan slowly emerges from his self-induced haze of despair and alcoholism he seems to be guided by a series of cryptic messages (how exactly he received them is one of the main mysteries) about what is actually happening in California. Rohan’s self-transformation is generally believable. Also, Rohan’s egotism matches the type of character he is meant to represent. Initially he is solely motivated for selfish reasons, but soon, he is forced to pick a side when Comus’ reason for funding the play is revealed. What is remarkable about the work is the thematic core that explores the intersection of performance, the powers of media, and state control. The most transfixing portions of the novel describe the play that is almost a character within the narrative. The novel revolves the forces that ordered the play to be performed, the story the play itself relates, the characters within the play, and the actors performing the play’s characters. Beautiful touches abound. For example Comus, the “benevolent” dictatorship that rules America, translates existing plays into movies to control the masses. Also, our hero often cannot distinguish between the reality of Miranda whom Rohan once loved and the ideal constructed via her screen presence – even her name, Miranda, ie, “the one who ought to be gazed at” reflects Rohan’s struggle. 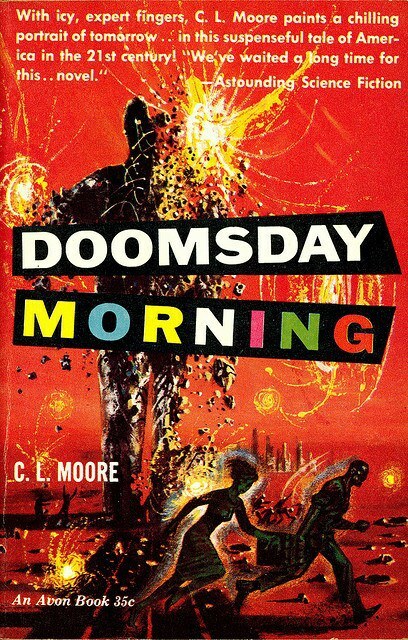 CL Moore’s Doomsday Morning is one of the more intriguing dystopic visions from the 1950s. Highly recommended all fans of classic SF. However, the slow pace and lack of immersive action (until the end) might not satisfy all readers. This was what the loss of civilization really meant. For the first time the full impact of the Galaxy’s great loss overwhelmed her. So long as she could see those lost worlds she might hope to win them back, but to be struck blind like this was to lose them forever. She knew a sudden agony of homesickness for all the planets she might never see again, a sudden terrible nostalgia for the lost, familiar worlds, for the fathomless seas of space between them. Ericon’s eternal greenness was hateful, strangling in its tiny limitations. The ancient Lyonese empire is looming towards disaster; the barbarian hordes of the H’vani have been razing planet after planet as they head towards the heart of the empire, Ericon. The aging emperor is preparing for peace talks to stave off the carnage, but his daughter Juille disagrees with him, urging no quarter against the barbarian hordes. After a spat, she storms off to the artificial pleasure planet Cyrille to interact with “normal people” under a disguise, where she meets the mysterious Egide; the two have a whirlwind romance, but something about Egide puts Juille on edge. Returning home, she finds her plot to kill the H’vani ambassadors has failed – and Egide himself is the nominal leader of the H’vani. Infuriated, she attempts to shoot him, only to find herself a H’vani hostage. And unknowingly, she may have set in motion unstoppable events that could doom humanity. ‘Judgment Night’ isn’t quite a full novel, in reality a serialized novella, but it’s got a lot packed into it as you can see – and that’s leaving out quite a lot of details, such as the godlike Ancients who put forth wisdom and lies to their supplicants, or the envoy from the now-conquered planet Dunnar who offers a mighty weapon to fend off the H’vani. Moore’s typical prose, lush and poetic and brimming with imagery, is at its full-blown glory. There’s quite a lot of moody ambiance and quiet introspection, just as there’s some brilliant action pieces – Juille blasting apart a planet with a lightning-gun was priceless. The story has a good balance and great flow, though it could drag at times when the focus became more internalized. Also, it’s a real downer, a poetic examination of what could be humanity’s downfall – if you haven’t noticed, the story’s got a strong “barbarians against Rome” feel taken to the extreme, because this war could be the apocalyptic doom of all humanity. (Granted, the ending is a dose of cautious optimism, at least for our two main characters who reach tranquility as the world around them burns. But the atmosphere and general message are tense and pessimistic.) I’m curious how it slipped under the radar to get published in Astounding, since it runs counter to editor John Campbell’s belief of homo sapiens superior. As I see it, ‘Judgment Night’ is a brutal indictment of war… and by proxy, human nature, which inevitably leads humanity to the conflicts which doom itself. I’d like to say that Juille is a strong, independent female protagonist, but that wouldn’t be entirely accurate; she is independent, but also headstrong, stubborn, more the spoiled brat of an interstellar empire then a sympathetic character. She acts out of her own selfish motives which causes no end of trouble for her, and taking matters into her own hands sets up the story’s despondent climax. And, by the end, her love/hate relationship with Egide has eroded down to just love. Still, she’s an active protagonist and the driving force behind the story; a lot of Moore’s fiction – especially the Northwest Smith and Jirel tales—have the protagonist just standing around while things happen to them. Not so much with Juille, who knows what she wants and goes after it with strict tenacity. She reminds me a lot of Moore’s earlier Jirel of Joiry, only more fiercely passionate. A barely-contained sensual element lurking just beneath the surface. In this case it’s the duplicitous seduction between Juille and Egide on the pleasure-planet Cyrille, which sets off a love/hate relationship that builds steam throughout the novel. Love and death go hand in hand in Judgment Night as well, an interesting allegorical pairing… very Romeo and Juliet. Paranoia and duplicity. None of the characters’ motives are obvious, and twists and double-crosses are frequent. At one point, Juille’s mind runs wild as the betrayed girl imagines adversaries around every corner; at another, she’s physically put in a paranoid, tense situation, during a game of cat and mouse as the she’s hunted by the well-armed Jair, who himself is not what he seems. A miasma of grim unease which oozes forth from the story. The tone and atmosphere of Judgment Night forecasts a future disaster, a feeling that something is going to happen, and that that something will be terrible. A distinct melancholia where, despite the positive, hopeful elements within the story, the atmosphere is pervaded by a pessimistic mood. ‘Judgment Night’ is the epic space opera to end all space operas. Highly entertaining, if a bit slow at times, rich in imagery and backed by a brilliant premise. One of those requirements for the reader interested in Golden Age SF, it really ought not to be missed. I was surprised to find the story wasn’t really a full novel, falling closer to short novel/novella territory. As an added bonus, the original Gnome Press version – as well as the shiny new Singularity & Co. ebook – feature four additional stories, so there’s plenty more material to read. The explorers and the drifters and the spacehands are misfits mostly, and, therefore, men of imagination. The contrast between the rigid functionalism inside a spaceship and the immeasurable glories outside is too great not to have a name. So whenever you stand in a ship’s control room and look out into the bottomless dark where the blinding planets turn and the stars swim motionless in space, you are taking a walk down Paradise Street. Jamie Morgan blasts onto the planet Loki with a cargo full of Sehft valued at 50,000 credits, only to find the market has bottomed out thanks to new ability to synthesize the substance. Morgan, a caustic loner, is already angered; his intense hatred of the settlers that come in his wake and inhabit the planets he opens up was set off as soon as he saw the humble Ancibel Station here on Loki. Now that his valuable cargo is worthless, and desperate for the credits, he turns to the criminal underworld to unload his goods. Bad choice; Morgan is too used to dealing with isolated, open worlds and not conniving career criminals. ‘Paradise Street’ reads more like a frontier western with its parallels of pioneers against settlers. There’s a country sheriff, a ton of Western jargon, and the climax includes the stampede of local alien cattle. If I didn’t know better, I’d say the author had cranked out an unsellable western – or maybe just re-used one of their old ones – and, after bolting on some futuristic gadgetry, submitted it to Astounding on a whim. Mankind’s attempts to colonize the planets have become based on decades of genetic manipulation and selective breeding, with the idea to use those created to adapt as first-line colonizers. After some centuries of terraforming the planet, they will have evolved their way back to become baseline humans, while developing their planets’ ecosystems along to allow unaltered humans to live there, paving the path for human space colonization. Some of the attempts fail miserably, like Torren, product of generations forced to live in a centrifuge to gain the musculature needed to survive on Jupiter (what, it’s written in 1950): Torren himself cannot lift his great mass at all, forced to live in a water tank suited to his gigantic bulk. Others are wild successes, like the colonizers of Ganymede who can survive to its harsh, frozen climate and oxygen-less atmosphere thanks to their functioning genetic modification. Torren is now the ruler of Ganymede, “the only child of the centrifuge to get out and stay out;” now the bitter old man wants to move forward ahead of schedule and terraform Ganymede early, making it hospitable for baseline humans while killing off all the Ganymedans in one fell swoop. His adopted foster-son, Ben Fenton, is the only thing standing in his way: tired of his foster-father’s brutal tendencies and in love with a Ganymedan woman, Ben refuses to let the entire Ganymedan race be slaughtered. Brilliant idea behind the story, though it is itself very straightforward space opera. Also, somewhat short. There’s an epic showdown between Torren and Ben, and a variety of intrigue working in the background, but it’s free from major action set-pieces; mature and thoughtful for standard space opera fare, with a great surprise ending. I enjoyed it quite a bit, though its brevity gives it some jerkiness, unevenness, and its ending’s lack of finality makes me wish it had been a novella or serial. Alas, it’s not; I’ll make due. A pair of scientists muse over their recent development – a special formula, in part deciphered from the works of ancient alchemists, which can rejuvenate its imbiber, returning their youth. Their subject is the one scientist’s aging father, brought back from the brink of terminal illness. As he grows younger, they realize how he’s changing, body and mind, and watch in abject horror as the situation develops. An exceedingly slow burn, very much a thinker, that revisits the old legend of the changeling babe, with a lot of thought put into the alchemists and their philosophy. Kind of a modernization of Faust with overtones of Lovecraftian dread, I thought the story more fitting of a 1930s issue of Weird Tales than an issue of Astounding in its heyday; interesting overall, but far too passive. Not much happens on a physical level, and it mostly consists of the two protagonists sitting around at various times, discussing the changes wrought in their subject. Still, while it’s my least favorite in the collection so far, its wealth of ideas outshines its motionless pacing. He shook his head at the bright world in the sky. He would have to get over the habit of regarding the heavens as a chart with a glittering pinhead for each planet, and so many thousand Thresholders, ex-Earth-born, bred for the ecology of alien worlds, pinned up there upon the black velvet backdrop for study and control. It wasn’t his problem any more. We return to the future of ‘Promised Land’ with its modified humans exploring the galaxy, but are now dealing with Edward Harding. Ed used to be a member of an Integrator Team, a band of seven special-forces-esque humans who are “integrated” via a machine to perform terraforming duties. (They also gain latent superhuman abilities due to the mutations inherent in the process.) Ed, recently booted off the force, is tracking down one of his old adversaries – Mayall, another ex-Integrator who was booted off the team by Ed. Rumor has it that Mayall’s forming his own Integrator team, on the payroll of Venusian or Ganymedan seccessionists. Ed will join, kill Mayall, or die trying. A twisty-turny tale with plenty of suspense and intrigue, this is one of those tales where you’re never sure who is on who’s side. It’s one of the longer stories in the collection, as well as one (arguably) the most fast-paced—”Heir Apparent” leaps forward in its tangle of betrayal and subterfuge, reaching twist after twist without any sign of slowdown. And as the capstone of the collection, it’s good that the tale is so strong: in my opinion it’s one of the strongest of the shorter works on display, and a perfect way to end the collection. Be ready for numerous surprises and a complex future, which can make things enjoyably confusing. When these works were first collected for their 1952 Gnome Press edition, they were meant as a definitive collection of CL Moore’s modern science fiction stories, working as a solo author without any of the collaborations she wrote with her husband, Henry Kuttner. I would argue that the definitive collection of Moore’s work would have to include some of those collaborations, as well as some of her earlier Weird Tales fare like ‘Shambleau’ or ‘Black God’s Kiss’. But what this collection sets out to do, it does well: a selection of her better works from ’40s-’50s issues of Astounding. ‘Judgment Night’ is the obvious best here: it’s longer, thematically deeper, beautifully written, and is so far the best display of Moore’s writing I’ve read. The other stories are interesting, but not required; I preferred ‘Promised Land’ and ‘Heir Apparent’ though all were readable. He rubbed a hand over his face and looked at it vacantly, as if he hoped the expression would have come off so he could inspect it on his palm, like dirt. Catherine Lucille Moore was the first major female author writing speculative fiction in the 1930s; her career blossomed through the 1940s and 1950s, until she stopped writing in 1957, the year before her husband (and fellow SF writer) Henry Kuttner passed away. While they each wrote on their own, collaborations became the norm after their marriage; together, wrote a huge body of stories for Astounding Science Fiction during the war years, carrying the magazine while other authors were doing government work. Her second husband forbade her from writing genre fiction; a damn shame; a crime even. It makes me wonder just how many great novels Kuttner and Moore never got to write. This book, Doomsday Morning, was her last solo outing, back in 1957. It’s unique, standing out in her bibliography one of the few true science fiction works she wrote, and not a Burroughs-style science fantasy or a Lovecraft-inspired weird tale. And it’s a dystopian novel with themes revolving around theater and state control. Not your ordinary science fiction novel. Following the Five-Day-War near the end of the 20th Century, the United States finds itself under the watchful eyes of Comus (short for COMmunications US) and its benevolent dictator, President Raleigh. Not only does Comus control the communications network, it’s also the Orwellian authoritarian state which makes the trains run on time and ensures each laborer is provided with daily food and provisions… at the cost of those various personal freedoms. After several decades, memory of life without Comus’ eternal oversight is nonexistent, though President Raleigh is growing quite old – and people fear the succeeding dictator won’t be as benevolent. Howard Rohan (no relation) used to work for Comus (no relation), as a brilliant actor, director, and screenwriter. Co-starring with his wife Miranda, their films became quite popular, and the couple gained wealth and prestige. Miranda’s death haunted Rohan, who (like most male protagonists in this situation) blamed himself for her death, assuming his inattentiveness was the reason for her demise. As Doomsday Morning begins, Rohan’s a Cropper, a futuristic version of Steinbeck’s migrant worker Oakies from The Grapes of Wrath, an angry, depressive drunk hiding from his past at the bottom of a barrel. Then, Rohan’s life undergoes irrevocable changes. Comus wants his theatrical expertise to help them out of a bind. Something’s stirring in California, where Comus has receded for some reason, and Rohan’s old acquaintances want him to bring Comus back into this barren land as part of a roving theater troupe. Things aren’t adding up to Rohan; why him, why now? How bad are things in California? And more pressing, why are references and predictions from one foggy dream coming true? – probably, Mr Rohan, because that was no dream. Thrust between Comus and open rebellion, Rohan is put in the role of leading man in a new Comus-authored play, and that of a wary spy in the real world. I’m always interested to see how things like governance, freedoms, and social control operates within dystopic/utopic fiction, and Doomsday Morning is a gold mine. Given its place in time – post-McCarthyism, and just before the launch of Sputnik – the novel has clear allusions to Soviet Communism and the Axis dictatorships. It’s also worth noting World War II was the last gasp of one-man rule in Europe; monarchies were on the way out, and fascism had lost any of the charm it might have had in the 1930s. Meanwhile, the West was working overtime to prop up dictators such as Batista, Trujillo, and the Shah of Iran to fend off Communism, so not all dictators were portrayed as Bad Men. Thus the novel is a lot more complex than a simple allegory for Stalinism; at one point, someone notes that President Raleigh doesn’t want to die knowing he was the man who’d turned America into a dictatorship. And we never get a clear picture of this new America, of day-to-day life under the dictatorship. We see a bus taking impoverished Croppers into Indiana – sounds like more of a critique of robber-baron capitalism to me, with laborers trapped into the life of servitude to large corporations – and a burnt-out, shattered California, mangled not by rebels but by looters – former Comus men, disillusioned rebels, and escaped prisoners. I would have liked a larger picture of this world, and to have known more about the Five Days’ War and the birth of an American dictatorship, but I’m also glad Moore kept this information secret. That’s not the point of the story; Rohan and his decisions are, since he ends up with the potential to alter the world. One of the general complaints about CL Moore’s writing is that more often then not, things happen to her protagonists, instead of the protagonists moving things forward. That’s been true for what I’ve read, the Northwest John Smith and Jirel of Joiry stories. And while there’s a bit of that in Doomsday Morning, Rohan is more assertive, driving the action forward and interacting with the setting. Although, much of the novel takes place in Rohan’s head. It’s introspective and psychological, with Rohan pondering everything, always drawn back to the memory of his lost wife. Rohan’s personal complexities enhance this heavily internalized first-person PoV, though some of his choices felt unnatural – the third act starts with Rohan coming to grips with his wife’s death, and this becomes incentive to choose a side in the conflict, which didn’t feel like a logical choice. Between that slow introspection and a more science fiction-y focus than Moore’s standard fare, Doomsday Morning is different from her earlier works. There are some intense action sequences that manage to intrude upon a novel about governance and theater, without feeling unnatural or rushed, and they’re damn good action sequences to read. The prose in, say, her Northwest Smith stories was lush and lurid, dripping with exotic scenery and visceral imagery. Doomsday Morning has beautiful prose, though it’s comparatively subdued, depicting the great Redwood forests of California instead of a Mars that never was. It has more of a pastoral Americana feel – similar to Simak’s City, or Brackett’s The Long Tomorrow – while retaining her beautiful imagery and smooth, compelling prose. If you’re not put off by heavy introspection – I wasn’t – the book makes for smooth and pleasant reading. I ended up liking Doomsday Morning despite its eccentricities: the pacing is subdued, introspective, and sluggish; the setting isn’t as well defined as it could be; many of the protagonist’s decisions didn’t make sense – some parts of the plot just happen. But you know what? It was a good book and a great read. Rohan’s a complex protagonist in the process of developing, three-dimensional and sympathetic, which makes his musings enjoyable. What we see of the setting is amazing, a glimpse into an alien America. The action scenes are tense and well-depicted; the introspection fluid and fascinating when it’s most relevant. The plot meanders across the tranquility of pastoral Americana before heading into an unexpected finale bristling with excitement. And Moore’s smooth and compelling prose made up for the sluggishness. Not a perfect book, but I’ll still recommend it to any science fiction fan.